"Turk's head" redirects here. For the French film, see Turk's Head (film). For the cactus, see Ferocactus hamatacanthus. For the brush, see Turk's head brush. A Turk's head knot is a decorative knot with a variable number of interwoven strands, forming a closed loop. 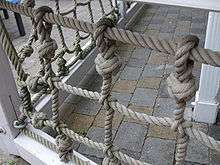 The name is used to describe the general family of all such knots rather than one individual knot. While generally seen made around a cylinder, the knot can also be deformed into a flat, mat-like shape. Some variants can be arranged into a roughly spherical shape, akin to a monkey's fist knot. The knot is used primarily for decoration and occasionally as anti-chafing protection. A notable practical use for the Turk's head is to mark the "king spoke" of a ship's wheel; when this spoke is upright the rudder is in a central position. The knot takes its name from a notional resemblance to a turban (Turkish: sarık), though a turban is wound rather than interwoven. The Turk's head knot is used as a woggle by Scout Leaders who completed their training course and were thus awarded with the Wood Badge insignia. Each type of Turk's head knot is classified according to the number of leads and bights and method of construction. The number of bights is the number of crossings it makes as it goes around the circumference of the cylinder. The number of leads is the number of strands around the circumference of the cylinder, before doubling, tripling, etc. Depending on the number of leads and bights, a Turk's head may be tied using a single strand or multiple strands. Mathematically, the number of strands is the greatest common divisor of the number of leads and the number of bights; the knot may be tied with a single strand if and only if the two numbers are coprime. For example, 3 lead × 5 bight (3×5), or 5 lead × 7 bight (5×7). 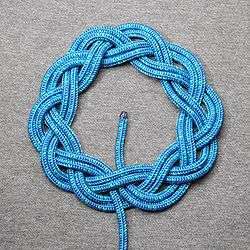 There are three groupings of Turk's head knots. Square, where there is a difference of one between leads and bights (7×8 or 8×7). The number of bights determines the shape found at the center. Three bights create a triangular shape, while four create a square. A two lead, 3 bight Turk's head is a double overhand knot. 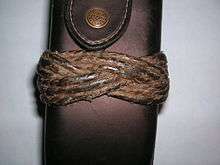 The World Organization of scouting uses a variation of the Turk's head knot called a woggle to affix their neckerchiefs and as a fire starting tool. It is an official part of the uniform. ↑ Shaw, George Russell (MCMXXXIII). Knots: Useful & Ornamental, p.61. ISBN 978-0-517-46000-9. ↑ Bozhuyuk, M. E. (1993). Topics in Knot Theory, p.3. ISBN 978-0-7923-2285-6.